Happy Friday! This is my last Friday off of work before I start back to school--teachers start next Friday. Today I'm linking up with Andrea for Friday Favorites! One of my FAVORITES every summer is being able to go to the pool and lay out. That hasn't happened much this summer, but I haven't let that stop me! The other day I packed a few things up and took them to our back patio so I could enjoy the sun and privacy out there! As you can see, I brought a fan outside (because we were under a heat advisory), ice water, a snack, and our bluetooth Bose speaker to listen to music. And I lasted about 20 minutes haha! It was hot! Eventually this land will all be houses, so I'm enjoying the privacy while I can! I am loving The Astronaut Wives Club! It's definitely a FAVORITE and I'm hoping there's a second season! I remember seeing this show advertised earlier this summer and I'm always up for a good period show. So far I have loved watching the clothes and hair styles/make up evolve as the years pass in the show. Who else is watching this? Hanging out with my sister this summer is my most favorite FAVORITE! (Even if she doesn't read this blog haha!) She recently traded in her BMW convertible for something a little more practical for her new job and I tagged along with her to the dealership to pick up an extra key for her new car. I got a massage yesterday and oh my goodness, what a FAVORITE! I scheduled this massage to celebrate my survival of statistics! I got a therapeutic massage at Silver Stone Salon for an hour, and I've already made my next appointment for another massage. Sometimes we just need to treat ourselves, right? 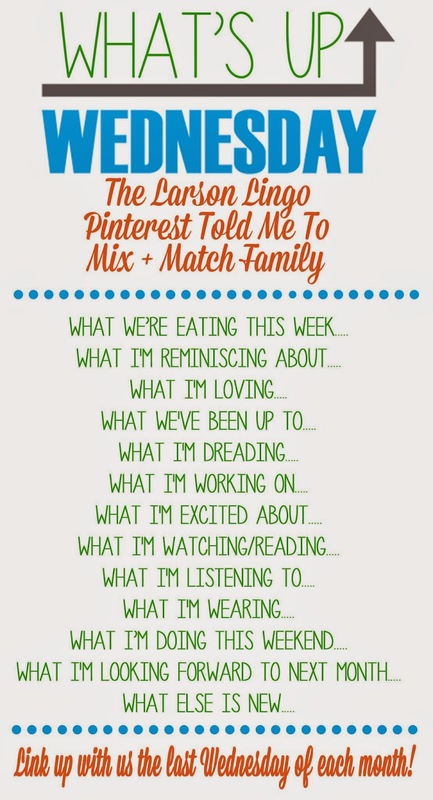 I'm participating today with Christina at The New Mrs. with her Own It linkup. I love reading these and decided that today I needed to join! Basically you just list the crazy different things you do and own them! 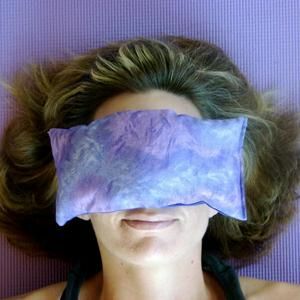 I sometimes sleep with a headache pillow over my eyes. I know it sounds so crazy and Dustin thinks it's weird but if it helps me sleep better, then why not? I think it all started one time when I had a horrible headache and my mom bought me this white minka-dot lavender headache pillow. I put it over my eyes to get rid of my headache and had the best sleep ever. Now sometimes when I wake up in the morning and the sun is starting to rise, I'll put that pillow over my eyes and it puts me in a deep sleep. I can't sleep unless my top sheet and comforter are evenly lined up. Yes, this is a little weird and I have no idea where it came from. Before Dustin and I got married, Janie tried to explain to him this little quirk about me but I don't think he fully understood until we got married. When Dustin is on nights and he has to sleep during the day, he will make our bed since he's the last one in it. Sometimes before I go to bed that night, I will have to make some adjustments to the sheet and comforter to make sure they are lined up evenly. Don't get me wrong, I am so thankful he makes the bed sometimes, but I just have to even things out every once in a while! I love reality TV. There, I said it ha! I love watching shows on E! and Bravo. I know people think it's so weird because I'm an English teacher and I love to read and have intellectual conversations, but reality TV is my guilty pleasure. It takes no thinking whatsoever to watch a reality show, and I love seeing how people live their lives. I hate bananas. I can't stand to smell them, to touch them, and I can't have anything in it with bananas. As a child, I used to have to make my dad a banana sandwich everyday for his lunch and that contributed to my hatred for bananas. Then I had an elementary teacher who made me eat a banana that a girl brought at a class snack before I could go to recess. It's like I suffer PTSD from those two moments. I wash my hands immediately after I workout. Whether I'm at the gym or at home, as soon as I finish my workout, I go wash my hands. I don't think it's more of a germ-phobia at the gym, but I don't like my hands feeling so sweaty and nasty so I wash them when I'm done! You can bet I washed my hands as soon as I got done working out with my sister! Thanks for reading this! It was fun thinking of the little quirks that make me who I am. Check back tomorrow for Friday Favorites! Happy Wednesday! I'm linking up with Shay from Mix and Match Family for her What's Up Wednesday! posts. I joined Weight Watchers again last week so I've been making lots of WW friendly meals. This was a picture I sent to my sister. This taco pie was so so good and will be made again! Sunday was our one year anniversary! 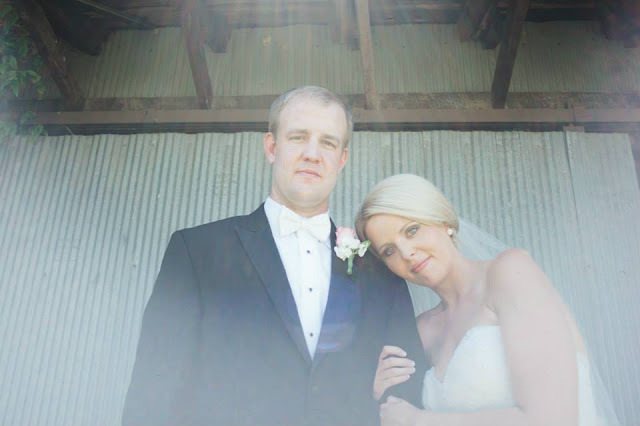 If I could relive our wedding day again, I would do it all over again the exact way I did a year ago. I loved everything about our wedding that I wouldn't change a thing! Our new house! Sunday also marked one month in the new house and I love it! We live in such a great area in town. I'm excited to see how our subdivision will grow. With that being said, the lot next to us is empty so I'm curious to get to know the next people who decide to build in this neighborhood. We really haven't been up to much this month. Dustin has been working lots of overtime because they are short a few people at work, and he's been doing a few things around the house. I finished up my summer term of grad school--and made my first B.....in statistics. I'm just glad I survived that class. I've also been trying to buy home decor items a little at a time to decorate our house with. It's going to be a work in progress! We've just been enjoying our new home and being home with each other! School? I have mixed feelings about this. I love the freedom of a summer schedule and being home with D when he's off during the week, but I love the structure of the school year. I honestly can't wait to meet my kids though! Losing the 10 pounds I gained since I got married. Decorating the house. I'm reading Go Set a Watchman like the rest of America. For some reason though, I just am having a hard time getting into it. I think it might have something to do with an article I read before the book was released about Atticus being a different character than we grew to love in TKM. I haven't gotten that far yet, but I will finish this book by Friday. I got this gorgeous dress on our anniversary! It's even school appropriate....such a teacher move ha! Lots of this. Since this weekend is technically my last weekend before I start school, I'm going to relax! And go to the mall! Alabama football starting back! ROLL TIDE! Not much around here! I start back to grad school in about two weeks so I've got a nice little break right now. I plan on reading a bunch of books between now and then! What will you miss most this summer? 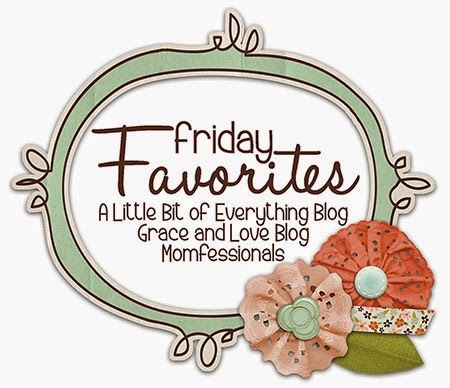 Check back Friday for my Friday Favorites post! 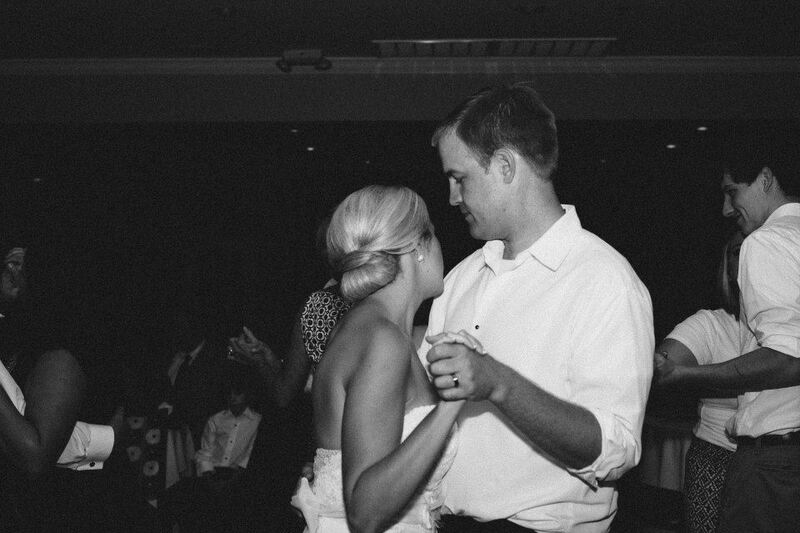 Wow, I can't believe that we've been married for one whole year! You know you're getting older when you say that time flies but it seriously does! This past weekend was full of celebration--Saturday was Dustin's 30th birthday and then yesterday was our one year anniversary. Yesterday morning Dustin came in from work, woke me up by telling me happy anniversary, and then he told me not to go in the kitchen until I woke him up. Well of course I couldn't go back to sleep, so we exchanged gifts at 6:45 AM Sunday morning. I got a new umbrella, monogrammed rain jacket, picture frame, dress from Nordstrom, and a shirt from Anthropologie. Apparently I should have put it in the fridge after it was almost all thawed out! Oh well--it still tasted pretty good! Our cake really was so good at our wedding, and we were pleasantly surprised when we tasted the cake topper. Excuse the iPhone photo, but that's what happens when it's just y'all two. We had to have a selfie before we went out to eat! And he made me take one, too. This is the dress I left our wedding in a year ago! Before we went out to eat, we stopped at Steel City Pops's newest location in Bridge Street. We love SCP! I also got the cutest new dress at Anthropologie before we had to be at our reservations because my dress from Nordstrom ran small and they were back-ordered until September. Lately I've been a little discouraged in people and the world around me. Nothing in the news is positive anymore, and there's so much pain and suffering--even in my small town. Yesterday it seemed that God used a lot of little things to prove that His love for me is the ultimate--that I don't find my joy in others but only in God and worshiping Him. In everything that happened to me yesterday, God reminded me to not wait for people to come to me, but to love and pursue those in my path because we are all made in God's image. "So while Leviticus emphasizes the importance of maintaining distinctions between the sacred and the non-sacred, the holy and the non-holy, it also emphasizes that everyday acts of kindness and love and mercy are incredibly sacred, incredibly holy, because they show forth the incredible kindness, love, and mercy of the One who is ultimately sacred and holy." Then right before I was about to leave for church the doorbell rang. It was three kids from a house down the street with a pie! As soon as I opened the door they said, "Welcome to the neighborhood!" I could have cried at the kindness shown to Dustin and I. I refrained myself from stooping down and hugging all three of those children, but their small action reminded me to rest in the Lord's sovereignty over everything. Last night I really sat and reflected on neighborly love. I feel a mission here living in this new neighborhood, and I can't wait to meet everyone and build relationships in order to reach the lost on my street. But I remembered that article on Leviticus and how it talked about neighborly love being more than just sharing the Gospel, but that it also includes things like extending mercy and pursuing reconciliation and being just and fair because all of these things show them God's mercy and love for us. God's love for us is the ultimate because he loves and wants us so much that while we were still sinners, He sent His only Son to live a perfect life as 100% human and 100% God, to die the death that we deserved to die on that cross in order that we might have a relationship with Him. Please email me if you have any questions about this! I love all things strawberry! I also love easy dishes, and the recipe I'm going to share with you today is the easiest thing I've baked. Anytime I take these somewhere I always get so many compliments, and it's great because they are so easy! I can't emphasize that enough! This may be a recipe you've already heard of and made, but if you're like me, I didn't know about these cookies until about two years ago. Now I make them all the time! 2. Mix eggs, oil, and cake mix together in a bowl. Yours will look like this! 3. Spoon batter onto a cookie sheet. I put mine on my Pampered Chef stone, but if you do a metal cookie sheet then you might want to spray it first. I baked mine for 9 minutes and then I let them cool completely on my stoneware before I removed them. The greatest thing about this recipe is that you can change the cake mixes out each time you make it--chocolate, red velvet, butter pecan, whatever you want! AND another great thing is that you can make cookie sandwiches! My sister and I love these and our favorite is two red velvet cake cookies with cream cheese icing in the middle. People love it when I bring these over! Enjoy! This coming weekend is going to be a big one for the Shaneyfelts! On Saturday, July 25th my cutie husband turns 30!! (insert big eyed emoji here) And on Sunday, July 26th we celebrate ONE YEAR OF MARRIAGE!! Eeeek! I'm so excited! Unfortunately Dustin has to work this work this weekend, so this past Saturday I surprised him with a surprise birthday party :) Of course I picked the craziest time of the summer to throw it (think work traveling, major grad school assignments due, two finals to take for grad school, etc) but it was either this past weekend or two weeks from now. I had great help in planning and getting things together, and I am especially thankful for Janie, whose husband Chris basically babysat Dustin while Janie was at my "Pampered Chef" party (my mom came up with that awesome excuse for cars at our house....go Mom!). Okay, so I planned poorly on getting the cake. I left my house and told D that I had to go deliver some catalogs to some people who couldn't make it (it literally took me forever to come up with that lie because I don't lie and am very uncomfortable doing it) and instead I went to go get his cake. It's about 100 degrees outside here so I knew I couldn't leave it in my trunk until he left with Chris, so I called my sister to meet me at our church parking lot for me to give her the cake! She did! And doesn't she look so happy to be getting a massive cake to take home and look at but not touch? This is set up in the dining room since we don't have dining room furniture. I went above and beyond on those decorations didn't I? Ha. I think if I didn't have to travel to Atlanta earlier last week and then write two papers and do a statistics project and study for two finals, then I would have had more time to decorate. Oh well. At least I stuck with a green and blue color scheme! I wanted to do a small and intimate surprise party since this was actually the first big thing we've hosted in our new home. It turned out great and I can't wait to host more events! This cake. Not what I was expecting. Publix, when you tell me that you'll do confetti on this cake, I'm expecting a little more excitement than this. The birthday boy!! ....a week early though. He's still 29, y'all, and proud to say it! I'm so thankful for her willingness to come to the party hours early just to help me get things together....and to loan me her husband to keep mine away. The Shaneyfelts and the Spikers! I am so thankful to everyone who took time out of their night Saturday to come celebrate Dustin's birthday! It meant a lot to both of us to see his family and friends celebrating with him! I'm a little sad to see this Friday come because I'm just one more Friday away from the start of school. I've got mixed feelings about school starting--usually I am ready to get back to a routine, but this has been the first summer Dustin and I have been married and now living in our new house and I have loved being home every single day (well I'm not home every day, but you get what I mean). I'm going to miss being home with him during his off days when school starts back. As usual, I'm linking up with Andrea and Erika for Friday Favorites! I'm starting a new series on my blog!!! This is my first series to do that I have come up with because I usually link to other blogs for series--like the Friday Favorites that I do. I will be featuring different home tours every 1-2 months on my blog and I can't wait! I have always loved looking at house plans and home decor so be looking at the beginning of August for my first home tour! It's definitely going to be a FAVORITE!! Hint: It's not mine, but she's been my BFF since 3rd grade! Dustin finally mounted our TV above the fireplace and I helped. It was not the most fun activity we've ever done simply because it took HOURS. But the TV is mounted and now all we have to do is hide the wires! This is a FAVORITE because we now have our TV hooked up and mounted! Yay for catching up on all of my shows! This huge window in my bathroom is definitely a FAVORITE because it lets so much natural light in. But it is HOT in the morning! This summer I have kept the light off while getting ready and I only turn it on when I put on my mascara. It's been really nice! Rompers are my FAVORITE and I found this in Old Navy the other day. I hardly ever go into Old Navy but I had to run to Target so I dropped in and found this cute chambray romper. They didn't have my size, so I didn't buy it but I'm telling you to stop by Old Navy! While I was in Atlanta for my conference this past week, we took the MARTA to Lenox Square Mall in Buckhead. I went into Athleta for the first time ever and found the BEST EVER LEGGINGS (a definite FAVORITE) that I just had to have!!! I texted this picture to Dustin and hinted to him that I want these before the weather gets cold--probably my birthday...or a just because present! Next week I'll post a recap my work trip to Atlanta--we did lots of eating haha! 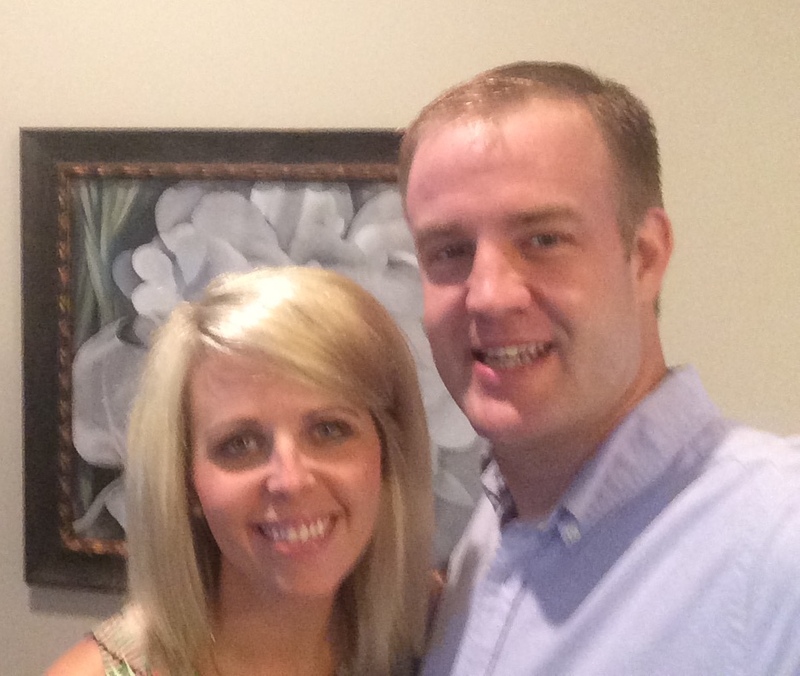 On Monday's blog post I mentioned attending a big conference in Atlanta for teachers. As you read this, I'm probably attending one of the last sessions right now. I've loved being in Atlanta for this conference just for the nightlife. (I'll write more about our whole trip tomorrow.) It's very different from small town Alabama where I'm from! The food has been the best and last night we went to the rotating restaurant on top of our hotel. It's called Polaris and apparently it had a huge history behind it. It's only open Tuesday through Saturday and they do not take reservations, so it's first come first served. Once we rode the elevator up to the restaurant, I saw just how small it really was so seating really is limited. I would suggest going for an early dinner. The decor is fabulous, and as soon as you are seated, you're handed a menu that is literally a novel. The first few pages tells of the restaurant's history. It opened in 1967 and has served lots of US presidents. The hotel has a rooftop garden and bee garden so the menu changes frequently to use seasonal vegetables. The restaurant takes a full hour to do one complete rotation. My favorite part was rotating by the kitchen. It was completely open and I loved watching the chef and his sous chefs hard at work. Since the three of us had an early dinner in the lobby level of our hotel at a restaurant named Sway, we opted for dessert for all of us and drinks for the girls. Our view when we were first seated. If you look closely, you can see GA Tech stadium! And since the restaurant is small, every table is by the window so you don't have to look over someone to see the view. Our waiter was great and offered to take our picture! Can you see the novel of a menu? You can see the rooftop garden and bee garden on part of the hotel. Our desserts! At the top was Jodi's tropical pave, then Maribeth's chocolate dome, and then my pecan cake with sweet tea sorbet and roasted peaches. It was called Southern Comfort. We taste-tested each others and I like Jodi's and Maribeth's the best. Oh and by the way, I hate heights and I was so proud of myself for being able to eat at this restaurant! I had to close my eyes on the elevator ride since it was a glass elevator, and I was a little nervous when we first got up to the restaurant. But I made it and it was worth it! Happy Monday! I'm attending a conference in Atlanta right now learning all about literacy implementation in curriculum. So while I'm not going to blog about that, I was recently tagged by Christina to do a list of 10 likes and dislikes, and this gave me the perfect opportunity to blog about it. What a great idea for a Monday post! 1. Studying the Bible--I'm actually going through the Spiritual Disciplines for the Christian Life by Donald Whitney. I recommend this to every Christian! He's super easy to read, and spiritual disciplines are things that all Christians need to be doing. 2. Southern Living magazine--Now that we're in the new house, I've signed up for a subscription. I can't wait! I love everything about this magazine, and also that it's published in Birmingham. 3. Girl time--Who doesn't like spending time with your best girlfriends? 5. NYFW--Also known as New York Fashion Week. The fashion lover in me is dying to attend one of these weeks. 6. Handwritten notes--There's something so special about receiving a handwritten note either in the mail or with a gift. 7. Christmas--Not only do I love the meaning behind Christmas (celebrating the birth of the Savior who would ultimately serve as a perfect substitute for me on the Cross), but I also love the Christmas spirit that comes with the holiday. I love the music, decorations, movies, lights, drinking hot chocolate....everything that comes with the holiday. 8. Running--This is one that I need to get more serious with, but running is a stress reliever! 9. My book club--I love the ladies in my book club! They have become such wonderful friends to me! 1. St Patrick's Day--What's the purpose of this holiday??? 3. Cargo shorts--I'm going to burn Dustin's cargo shorts one day. He's not allowed to wear them in public EVER! 4. The Prosperity Gospel--No where in the Bible does it say that your faith will make you rich or healthy or that you'll have an easy, comfortable life. 5. Being on time--Ask my husband, I am never on time. I can wake up an hour early and still be late. 6. Bad language--I find that the closer to Christ I grow, the more I can't stand listening to vulgar or crude language. 7. Cleaning the shower--Especially now that we have a huge shower, I hate cleaning it. 8. Juicy Fruit gum--The smell is awful! 9. Bananas--YUCK!!!!! I know they are good for you, but I just can't do it! Happy Friday, y'all!!! I am so happy to be back to blogging again after being without the internet for TWO WHOLE WEEKS!!!! Am I complaining?? A little haha! You don't realize how much you use the internet (online banking, checking email, looking up a recipe, social media, etc.) until you're without it, and Dustin and I tried to not use so much of our cell phone data--tried being the key word. Can I say it was quiet at my house? Anyway, AT&T FINALLY came to hook up internet and cable yesterday and now I am back to blogging! 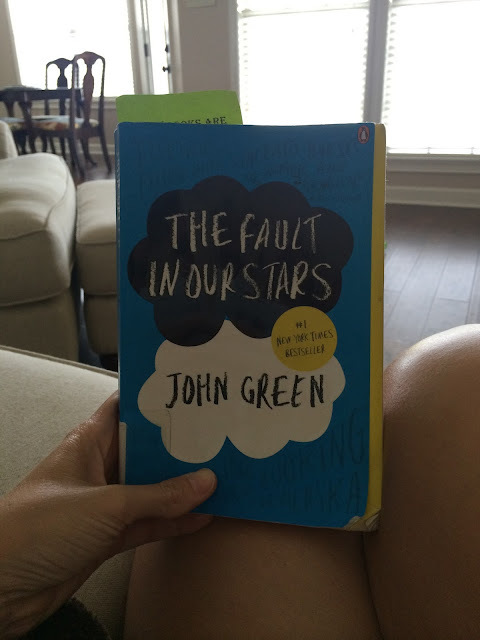 As usual, I'm linking up with Andrea for Friday Favorites. Remember how I said we went two whole weeks without internet and TV??? Well that left me with a lot of time to procrastinate grad school homework (which I'm making up for right now) and lots of time to read! I went by our public library and checked out three books. I read two of those books and gave up reading the other because I'm over the dystopian literature right now. (Side note: I told Dustin that same thing and then asked him if he knew what dystopian meant. He said no, and then I proceeded to explain dystopian vs utopian and then felt sorry for him that he married an English teacher.) I reread The Fault in Our Stars because I love it so much and cried at all of the same parts that I cried in the first time I read it. I decided that I need to buy my own copy because I want to underline every beautiful sentence I find in this novel. Stay tuned to lots of posts coming soon!!! SOOO much happened in the two weeks I was gone from blogging that I'll have to break it down into a few posts. 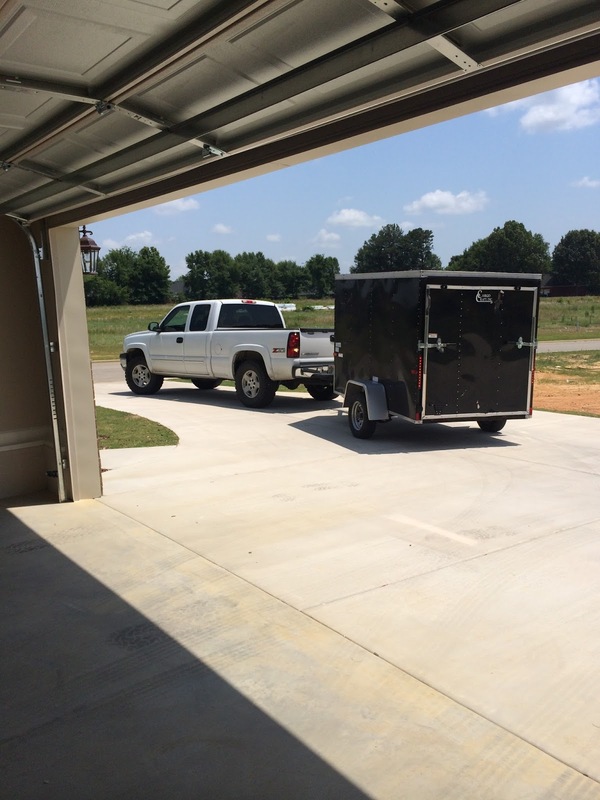 It's official.....we have moved into our new house! Everything with the move went smoothly, but we're still without internet and TV. Since our neighborhood is brand new and we are the most recent house built, AT&T needs to run cables down to our house and it's taking a while. I even tried to see if I could pull up our neighbor's wireless--no such luck. My phone didn't even pull up any networks since our house is the last one on our street. Oh well...I've had lots of time to clean and re-clean. Tomorrow, I'm running by the library to get a book now that I have plenty of time to read! Dustin backing our first load up our driveway! As you can see in the background, there are lots of empty lots. 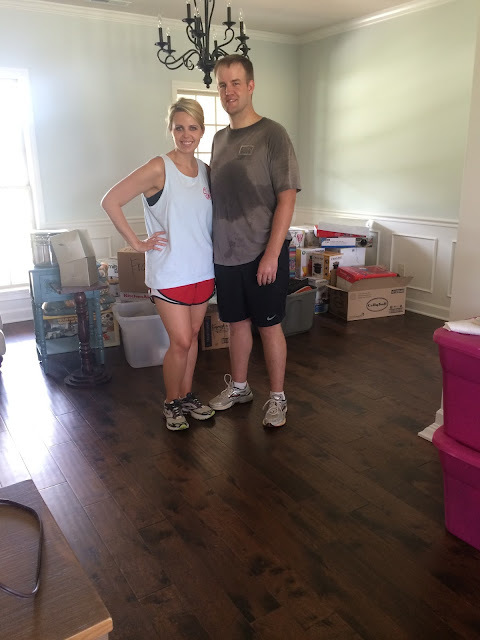 Mom snapped a quick photo of us after moving a few things in. Our dining room looks very different now. Hopefully we'll have internet by next Monday and I'll be able to blog regularly again!